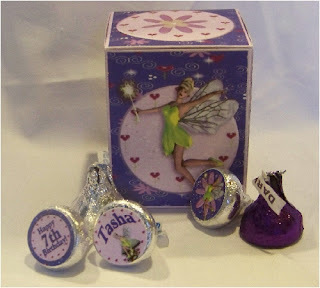 There are so many cute party favors you can have for a Tinkerbell or fairy party. I had a hard time narrowing down which ones to have on my party favor table. 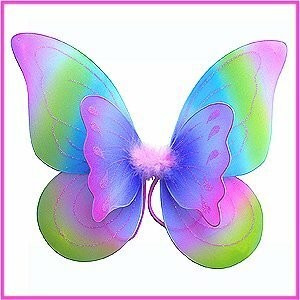 Each girl will have her own set of Fairy Wings to enjoy. I'm sure the girls will love to prance around the party and play dress up at home later with these beautiful wings atop her shoulders. Each little girl will get to take home a personalized name plaque for her room with Tinkerbell watching over her each night. I'm also planning to make these cute little boxes with Tinkerbell on them. 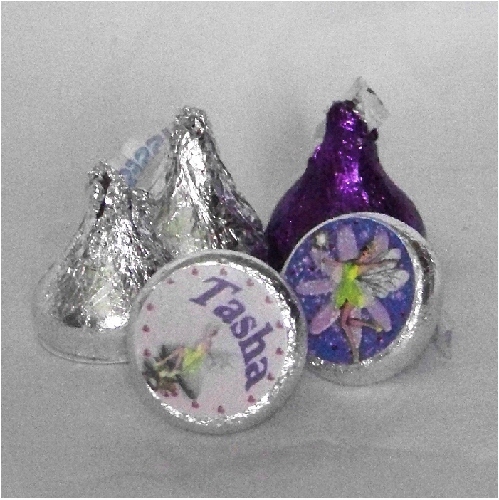 They can be personalized with any greeting the birthday girl wants and are going to be filled with Hershey kisses personalized with Tinkerbell graphics and sweet sayings. Our little Fairy Princess is going to have kisses with her name and "Tasha's 7th Birthday" on them. 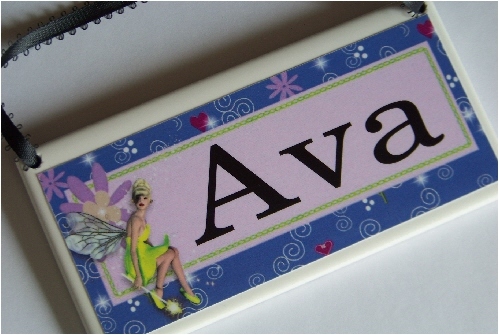 Plus pictures of Tinkerbell, for a total of 4 different designs. 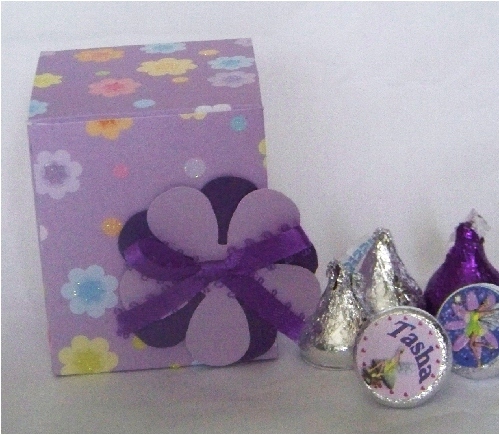 If you want to make your own favor boxes, you can easily do so out of cute scrapbook paper. Take a piece of cute paper...I have this Glitter Stock Set and I use it for ALOT of projects. I cut it down to run through my printer and printed off a box template on the white side of the paper. JersGirl's templates. I've always been happy with hers and she has a HUGE selection, so check her out. 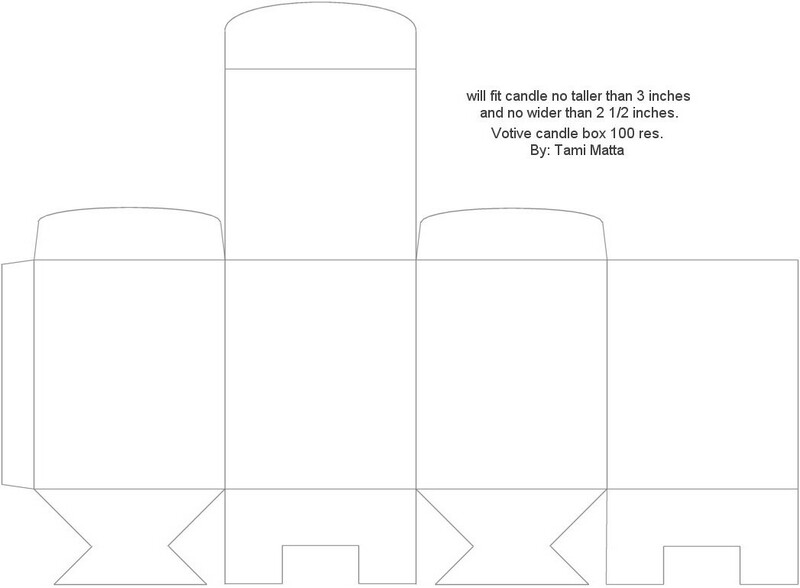 You can get this votive holder template HERE. Cut it out around the outside lines and score on the insides. 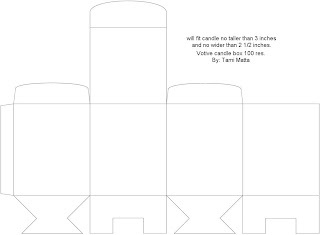 Fold along the score lines and glue together for a cute box. You can embellish with cute scrapbook elements and fill with sweet treats! This little girl's party isn't for a couple of months, but I'm trying to get it all set up now since I'll probably be moving soon...so I don't know who the guests are going to be yet. Since I'm taking pictures so the mom can set up the party by herself, I need to make a few plaques to show her what to do with them. 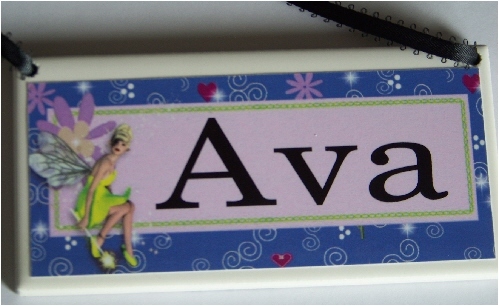 I'm looking to make 5 Tinkerbell plaques...if you would like one with your little girl's name on it, please leave a comment here. I'll pick 5 winners on May 4 at noon (EST) and make those plaques up. After the photos on Friday, I will mail out the plaques to each of you. 1) Leave a comment here telling me what name you would like on the plaque. Don't forget to share your email so I can contact you if you win either by linking up your account, or giving me your email! 2) Visit my Facebook page and become a Fan, then come back and let me know. 3) Visit my Store and come back and tell me your favorite project. 4) Become a follower on my blog and let me know you are! I hope you guys are interested. This is one of my most popular plaques...and I hope you'll help me out and let me share it with you! I love the little messages on the kisses! THanks for linking up with DIY under $5!